US-led counterdrug efforts have failed to stem the tide of heroin flowing out of Afghanistan. Cultivation has increased, but a number of factors outside of those failed efforts have led to that increase. But the vast majority of opiates produced in Afghanistan don’t reach the US. In 15 years in Afghanistan, no counternarcotics effort undertaken by the US, it partners, or the Afghan government has led to sustained reductions in poppy cultivation or opium production. That was one of a number of findings of a Special Inspector General for Afghanistan Report issued this week, underlining insufficient, uncoordinated, and at-times counterproductive initatives in Afghanistan to reduce drug production there. Between 2002 and 2017, the US government has allocated roughly $US8.62 billion to fight narcotics in Afghanistan. But the drug trade remains entrenched. 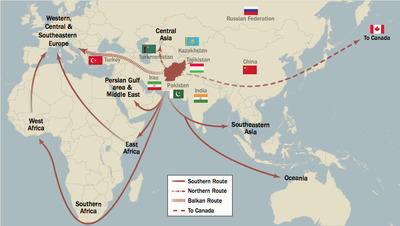 Opium is Afghanistan’s largest cash crop, reaching an export value of $US1.5 billion to $US3 billion in recent years. In 2017 alone, poppy cultivation was thought to support 590,000 full-time jobs – which is more people than are employed by Afghanistan’s military and security forces. 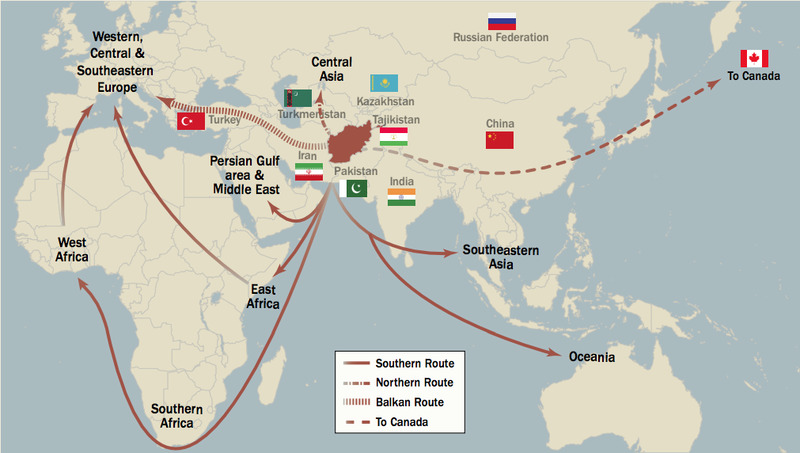 SIGARHeroin and opium produced in Afghanistan are trafficked largely to Europe, Africa, and other parts of Asia. The primary markets are Europe, Asia, and Africa. Opiates from Afghanistan travel through other Central or South Asian states – drug addiction has exploded in Iran, with opium making up two-thirds of consumption – to reach destinations in Europe and Asia. Drugs also travel maritime routes to Africa and Oceania. Ninety per cent of the heroin seized in Canada comes from Afghanistan, but scant amounts reach the US – 1% or less of the drug seized in the US can be traced back to the Central Asian country. 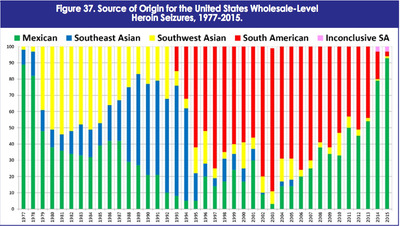 The amount of Southwest Asian heroin in the US peaked in the early 1980s, according to the DEA. It was replaced by Southeast Asian heroin – largely from Laos, Myanmar, and Thailand – in the late 1980s and early 1990s. 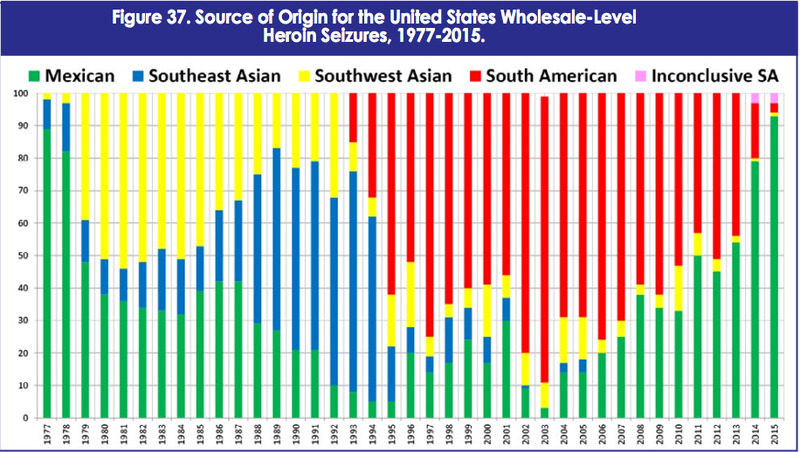 The amount of South American heroin found the US started to increase in the mid-1990s, but by the late 2000s, Mexican heroin started to become predominant – in 2015 it was the more than 90% of the heroin seized in the US. 2017 DEA NDTAThe share of US heroin sourced to Mexico has grown considerably in recent years. Opium has been cultivated in Afghanistan for centuries. It was under royal control from 1933 to 1973, but the Soviet invasion and occupation from 1979 to 1989 crippled the legitimate economy and allowed illegal enterprises and criminal networks to thrive. Production soared after the Taliban took control of most of the country in 1996. But it banned the crop in 2000, leading to a 75% drop in the global supply of heroin but leaving farmers destitute, as no alternative to poppy cultivation was provided. Cultivation was at a historic low in 2001, when the US and its coalition partners invaded. Counterdrug work was done in the period that followed, but the vacuum created by the lack of functioning Afghan institutions limited their effectiveness. SIGARDespite year-to-year variations, poppy cultivation in Afghanistan has steadily increased over the last 20 years. 2004 saw an increase in cultivation, which was followed by more concerted US efforts to staunch it as well as increased counternarcotics efforts by coalition partners. Cultivation leveled off in 2009 and 2010 – around the time of the US-led surge that brought more attention to combating the drug trade. But cultivation started to rise in 2011, compounded by missteps and a reduced emphasis on counternarcotics. “From 2013 to 2016, drug production continued at or near the highest levels ever consistently seen in Afghanistan,” the report states. Recent years have also seen eradication stall. 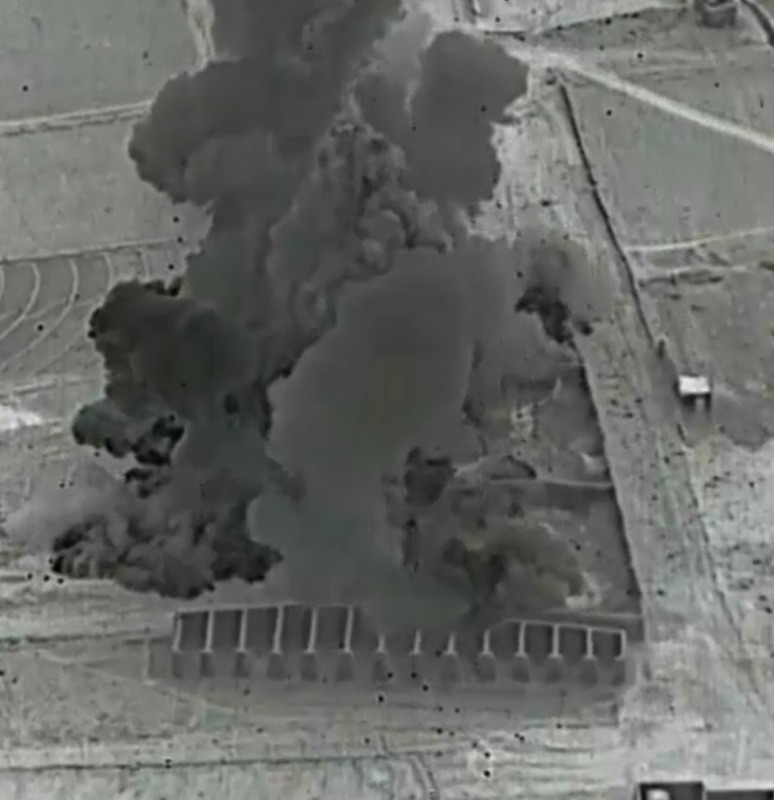 US Air ForceA US-led airstrike on a Taliban drug lab in northern Helmand Province, November 2017. 2017 also saw a new Trump administration strategy that brought with it an “unprecedented” level of attention to Afghan drug production by US military commanders, according to the report –marked by a “sustained air interdiction campaign” that included advanced aircraft striking rudimentary drug labs. The increases in drug cultivation make clear the failure of counternarcotics efforts, the report says, but it stresses that those failures are not the only factors that have led to the increases. “The exponential rise in opium poppy cultivation and drug production is rooted in far-reaching, persistent challenges in Afghanistan-namely, lack of security, a poor economy, weak governing institutions, and failures of the wider reconstruction effort,” the report states. “Given these challenges, there are serious limitations to the US capacity to bring about large-scale, lasting reductions in poppy cultivation and drug production,” it adds, noting the opium economy will continue to undercut US efforts in Afghanistan.